AGE: The rounded primary tips, plain and muted pattern to the wing coverts, along with the gray mantle feathers can be combined to age this individual as a 2nd cycle. A pale eye is revealed when zooming in closely and this readily points away from a 1st cycle. IDENTIFICATION: There are several features on this large gull that suggest a white-winger. Notice the "venetian blind" effect on the outer primaries. In particular, the outer webs and inner webs show a consistent dark, then pale, pattern. The appearance of the upperwing is plain and uniform with what could be described as a velvety feel. The cold blue mantle feathers are neat and tidy, fading into the upperparts with little effort. So which white-winger is this? 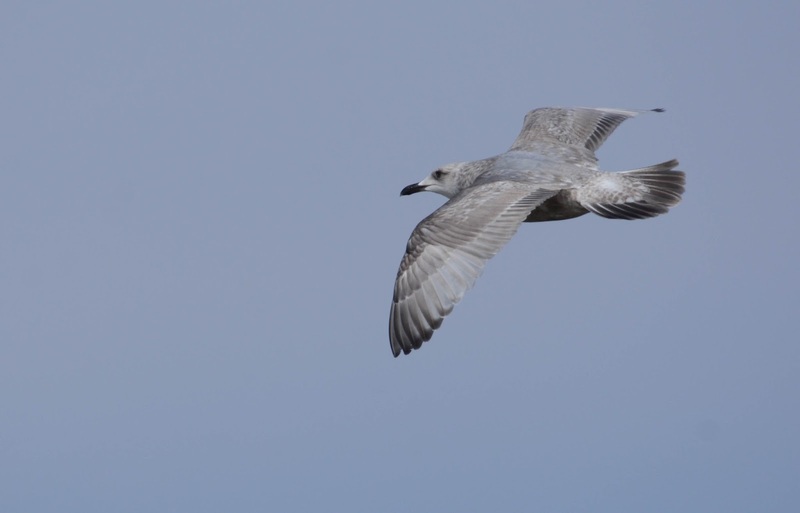 Thayer's Gull immediately comes to mind, but why not a Herring Gull? Herrings are much more contrasty at this age and typically show messier upperparts that are more splotchy. Also, a Herring Gull should show darker primaries and tail band - black if you will. Also, the all-black bill isn't unusual for this age in Thayer's, but it would be unusual for a Herring in its 2nd plumage cycle. The bi-colored bill and darker inner webs to the outer primaries point away from thayeri. 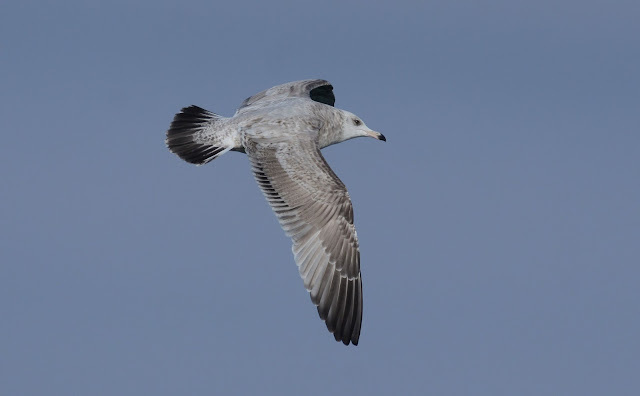 Our March Quiz bird is indeed a 2nd cycle Thayer's Gull, photographed in Port Washington, Wisconsin. February 2018.